853191 Jack Sparrow, Hector Barbossa and Gunner Zombie Magnet Set is a Pirates of the Caribbean Magnet set released in August 2011. 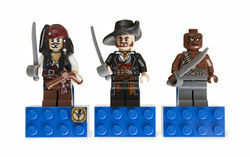 Included Minifigures are: Jack Sparrow, Hector Barbossa, and a Gunner Zombie. This is a description taken from LEGO.com. Please do not modify it. (visit this item's product page) Protect your fridge from pillaging and plundering with LEGO® Brand Pirates of the Caribbean™! Shiver some timbers with 3 fearsome fellows of the LEGO® Brand Pirates of the Caribbean™ building sets. Dare to decorate your fridge or locker with this treacherous trio from Disney’s Pirates of the Caribbean™: On Stranger Tides film, on 2x4 LEGO brick magnets. A great gift for any LEGO Brand Pirates of the Caribbean™ fan. Stick to fridge, locker or almost any metal surface! Facts about "853191 Jack Sparrow, Hector Barbossa and Gunner Zombie Magnet Set"
Protect your fridge from pillaging and plundering with LEGO® Brand Pirates of the Caribbean™!